My favorite part of going on field studies with my Winterthur classmates is seeing new sides to places I thought I already knew. 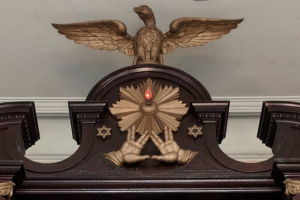 This year’s trip to southern New England opened my eyes to a new-to-me component of life in New England with visits to two historic sites: Touro Synagogue in Newport, Rhode Island and Vilna Shul in Boston. Elementary schools across the state talk about the Pilgrims landing at Plimoth in terms of Europeans seeking religious freedom and tolerance, but seldom do they mention the Jewish communities that also worked to keep places like Newport and Boston open and tolerant to all religions.